December 2005 - May 2006. Iridescent orbs float in smooth-as-glass lakes; a brilliant yellow chandelier hangs from the bough of an old oak; amber-colored reeds rise among the cacti and agave in the arid garden. Art will imitate nature and spark illusionary magic among the well-tended flora of Fairchild Tropical Botanic Garden beginning Saturday, when the Coral Gables conservatory opens a six-month exhibition of sculptures by renowned glass artist Dale Chihuly. The two dozen installations of glass and plastic sculpture cast a surreal landscape at the 83-acre arboretum: blue polyvitro plastic sculptures float like icebergs in a tropical pond; tentacled towers jut from a pool of lily pads; neon tumbleweeds cling to the ceiling of a fruit pavilion. But there's more than illusion at work here. Fairchild officials say the unprecedented exhibition will serve a two-fold purpose: cultivate new audiences for the 67-year-old institution -- particularly among the art-loving crowds in town for Art Basel Miami Beach -- and raise awareness and funds to further Fairchild's missions of botanical conservation, research and education. The sculptures symbolize the ecology that Fairchild's botanists have been studying and preserving, said director Mike Maunder, who compares Chihuly's sculptures to the artful flasks used by Old World herbalists to distill the essences of plants. Walking through the garden on a recent afternoon, Katrina Sandi, 36, of Miami, stopped by a fountain containing purple ''heron'' sculptures. ''Stunning, it's amazing,'' she said. 'I'm surprised at just how gorgeous it is. At first I thought, `Big deal. It's just gonna be glass,' '' Sandi said. She particularly liked the way some of the sculptures appear to deceive the eyes. Resting on a bench that overlooks the blue icebergs in Pandanus Lake, British tourists Malcolm Drabble and Gloria Spencer said the exhibition -- which is confined to the westernmost lakes and botanical collections -- complemented the garden without overpowering it. 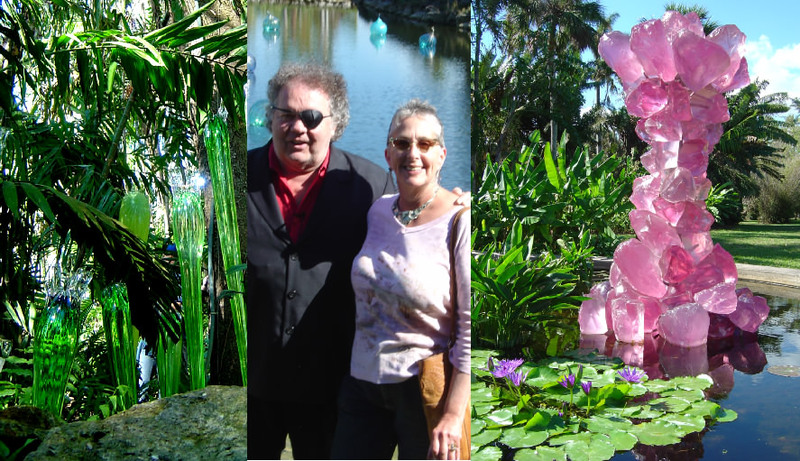 Chihuly's collaboration with Fairchild is part of the artist's recent foray into garden exhibitions. His glass in the garden exhibitions have drawn record crowds in Chicago, Atlanta and Columbus over the past four years. Kew, an exhibit running through January at London's Royal Botanic Gardens, has attracted 120,000 more people in its first four months than during the same time period a year ago. At the Franklin Park Conservatory in Columbus, Ohio, Chihuly's work was exhibited over nine months ending in July 2004. The conservatory's trustees and members were so enamored of the exhibition that they raised enough money to buy the whole thing -- nearly 3,000 pieces of glass valued at about $7 million. Fairchild officials expect as many as 300,000 visitors for Chihuly at Fairchild: A Garden of Glass, which runs through the end of May. That's about double the garden's attendance during the same period last year, said spokeswoman Nannette Zapata. Tickets to Chihuly at Fairchild are nearly double the regular rate of $10 for adults, $9 for seniors and $5 for children. Though Fairchild officials estimated the exhibition would cost $2 million when they announced the show in May -- with the greatest costs attributed to transportation, security and insurance -- Maunder said the financial details are now confidential. Among the measures of success, though, will be attendance and exposure in the field of botany. ''This is part of Fairchild's strategy for growing as a major scientific and cultural institution in South Florida,'' Maunder said. He added that Fairchild trustees are ''looking into'' buying one or more of the glass pieces for permanent display. All of the works in the garden will be for sale, Maunder said, though Chihuly isn't confined to the field. Pieces of the artist's studio glass sculptures are for sale in a gallery at Fairchild, with prices ranging from $4,000 to $5,000. This is not fragile glass, like a grandmother's heirloom china. It is thick and heavy, forged in furnaces and engineered to withstand high winds. The towers, some of which can weigh several tons, are composed of hundreds of pieces of glass clustered around steel support beams and weighted down with sand bags. A team of Chihuly's studio assistants began installing the nearly 25 tons of glass sculpture on Nov. 7 -- not an easy feat given the busy storm season that ended Thursday. Indeed, Maunder said, this year's succession of storms wreaked havoc with the preparations. Since Fairchild officials announced the Chihuly exhibition in May, a record 25 tropical storms developed in the Atlantic and four hurricanes struck or brushed Florida. ''Every time we had a storm, we really had to focus on cleaning up and getting the garden back together again,'' he said. Hurricane Wilma caused the most destruction, striking five weeks before the exhibition opened and felling trees in the arboretum and rain forest sections. When Tropical Storm Gamma appeared to be taking the same menacing path as Wilma on Nov. 18, Fairchild officials prepared to activate their emergency plan, which included wrapping some of the sculptures in plastic and dismantling others. Now that hurricane season has passed, Fairchild is focused on making the most of the exhibition. Chihuly will visit the garden for Saturday's opening and host a question-and-answer session at noon following an 11 a.m. tour. The garden also will host a brunch for Art Basel Miami Beach VIPs, exhibitors and others on Sunday from 9 a.m. to noon. Once sightseers are finished touring the exhibition, the garden's gift shop awaits with stacks of Chihuly coffee table books, postcards and desk calendars, as well as DVD box sets of the artist's past projects. ''People are really looking forward to it,'' Zapata said.